All major components are aligned to the base tray, thus making it maintenance & service friendly. Offers sturdy construction & flexible combination of various components like coils, filters, etc. to suit specific applications. Designed to occupy lesser floor space in comparison with horizontal units. Panel opening in front of the fan section enables easy maintenance & serviceability of the unit. As the name suggests, can be suspended from the ceiling, thus requiring zero floor space. Completely noiseless & can be tucked away above the false ceiling; or inside the conditioned area itself, thus reducing installation costs & giving flexibility to the desing of the interior. Fan & motor is mounted on a fabricated slide rail. A specially designed motor mounting base plate allows adjustment of the belt tension without disturbing motor alignment. Flexible fire retardant canvas connection is provided at the fan outlet. The drain pan is made up of Stainless Steel & insulated with a closed cell elastomeric insulation to avoid surface condensation. Efficient Filters: Apart from standard EU-3 type pre-filter, various types of filters such as bag & fine HEPA Filters with different levels of filtration can be selected. These filters are of progressive density type with high dust holding capacity & with lesser pressure drop, ensuring high energy efficiency. 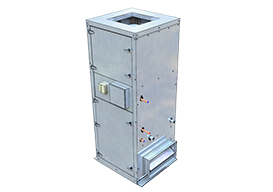 Low Leak Dampers: Powder-coated galvanized or aluminium volume control dampers of opposed blades & in aerofoil design are provided to maintain the fresh-air to return-air ratio. A wide range of control options are available that include motorized & manual operation of the damper. 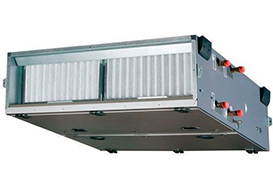 The option of sand trap louvers is also available for outdoor applications preventing sand or dust particles from entering the air handling unit. Energy Efficient Blowers: Energy efficient DIDW blowers have been incorporated. These are available in three types: centrifugal forward curved, backward curved or backward with aerofoil design. The option of plug fan without the belt & pulleys makes it suitable for clean room & pharmaceutical applications. Energy Efficient Motors: Motors account for nearly two thirds of the power consumption in an HVAC application. Even the smallest improvement in motor efficiency can significantly reduce energy consumption. Blue Star offers EEF1 motors meant for continuous operation. These motors make the AHUs highly energy efficient. UVC Emitters: The option of UVC Emitters inside the units is available to combat the growth of microorganisms. 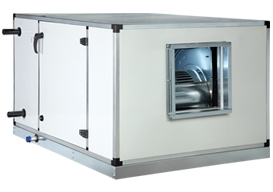 UVC Emitters ensure clean & sterile air at all times. Moreover, the system functions efficiently, resulting in optimum power consumption. Door limit switch automatically trips the motor/fan when the door is opened.